In addition, we will make a first attempt at identifying a potential high street for the area and subsequently locating a cultural institution, A Centre for Urban Farming, to serve as an attractor to the neighbourhood. More than a neighbourhood, our proposal will serve as a prototype; an algorithmic procedural model for urban growth which could be implemented throughout the city and larger region. The results of each implementation would be different and specific to the context within which it was situated. - Area and Topography of the site. 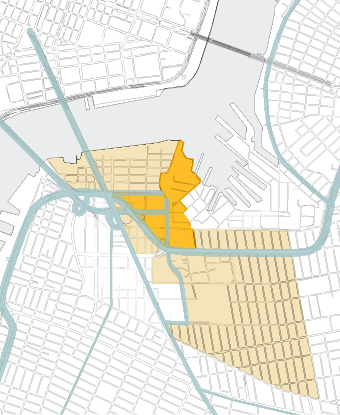 The new neighbourhood will connect the highly desirable neighbourhoods of DUMBO to the north and west, and Fort Greene to the south, as well as the converted warehouses of the Navy Yard to the east. It sits at a critical junction in transportation networks, easily accessible from Manhattan, Brooklyn and the rest of New York City. Our internal network should link to and provide continuity between these neighbouring communities. Currently the site is home to a automobile tow-pound lot and low-income public housing projects. We propose replace these with quality low cost housing integrated into a neighbourhood of mixed incomes and mixed uses. Adjacency to the Navy Yard will provide easy access to work space for small businesses and new food related jobs. The York St subway stop (linking directly to downtown Manhattan) is located at the western end of the site and within a 5 min walk to the centre of the new neighbourhood. 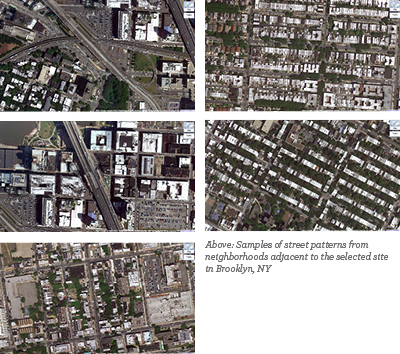 Brooklyn, NY has an overall population density is 140 ppl / ha. Manhattan overall by comparison is 280 ppl/ ha. When we examine smaller samples of residential blocks in the vicinity of our site, we find densities between as high as 538ppl/ha. However at the neighbourhood scale, we find that around 200ppl/ha is not uncommon for desirable residential areas. 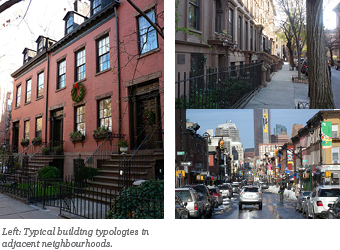 Brooklyn Heights for example, an attractive terraced neighbourhood to the west, with a mix of single-family and multi-family townhouses and some apartment blocks, has a population density of 205 ppl/ ha.